Sharp Teeth is a campy B-style, T & A, horror-comedy-romance micro-budget feature film geared teens and adults. Toxic heavy water from a university’s nuclear reactor leaks into its nearby nature reserve marsh changing the local fish. Luscious Lola Dent, mature journalism student gets her teeth into this meaty story to make the president’s honour list. Buff laid-back rookie Harbour police officer, Andy Kline would rather workout and make-out than do boring shoreline patrols. At romantic sunset, a giant carp surfaces and grabs a canoeing student couple. For the student newspaper prize story, Lola uses her charms to persuade Andy to do some unofficial cruising after reports of missing locals surfaces a severed finger and other body parts. Who’s more jealous of Lola and her investigative actions? Lola’s chemistry student boyfriend Earl on a new food breakthrough or the nuclear reactor’s incompetent assistant Greta? University Professor ‘Nuclear’ Irwin Bates must save his nuclear department from scandal while supervising blundering Greta. Eccentric environmentalist demonstrators get in the way of both university and nature reserve fundraising procedures. When government money comes in for an environmental carp barrier, more than one group becomes agitated. Director Frank Waters of the nature reserve has means to other income streams. When the corralled giant carp runs out of aquatic and acquired human food, it expands its diet into a local marina adding a twist to the showdown of Lola and Greta over Andy and Earl. Blending suspense, humour and romance, you’ll remember the camp hysteria and loony characters in ‘Sharp Teeth’. 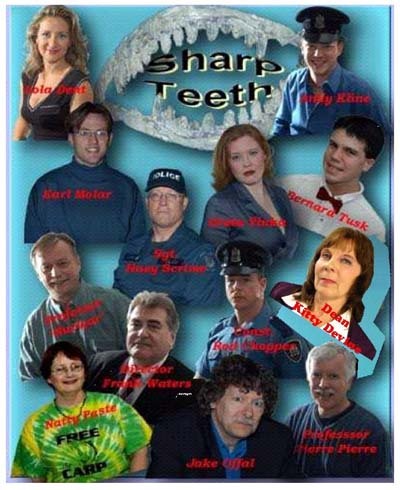 ‘SHARP TEETH’ premiered at Mohawk College, Hamilton ON on October 27, 2006. 20 film days – 100 cast and crew. Sharp Teeth is a movie that deals with the issue of an overly-agressive species of fish the Ontario Ministry Of The Environment sees as a nuisance. As the movie’s characters gain more sympathy or empathy for the Cyprinadae and the body count mounts, so does the comedy. Extremely convincing as a sub-documentary, this movie has a never-seen before denoument that isn’t to be missed. William Bruce. – we now accept Paypal. Also on Amazon: http://www.amazon.com/SHARP-TEETH-Mutant-independent-feature/dp/0969543271/ref=sr_1_6?s=movies-tv&ie=UTF8&qid=1384004746&sr=1-6&keywords=sharp+teeth and www.ebay.com. To get on our list for script readings, actor auditions, and film updates and events, please email movies(at)cjcpinc.com.